Thomson Reuters has reported results for the full year and fourth quarter ended December 31, 2011. Results include a $50 million charge primarily related to a reorganisation of the former Markets division incurred in the fourth quarter. The company also announced it had taken a $3.0 billion non-cash goodwill impairment charge related to its financial services business. This charge is excluded from adjusted earnings, adjusted EBITDA and underlying operating profit. The company reported full-year revenues from ongoing businesses of $12.9 billion, an increase of 5% before currency from the prior year. Adjusted EBITDA increased 20% from the prior year with the corresponding margin up 280 basis points to 26.4%. Underlying operating profit increased 9% from the prior year with the corresponding margin up 50 basis points to 20.0%. The reorganisation charge had a 40 basis point negative impact on both the full-year adjusted EBITDA and underlying operating profit margins. Revenues from ongoing businesses were $12.9 billion, a 5% increase before currency. Strong growth across the Professional division, up 9%, and a 2% increase in Markets division revenues drove the overall increase. Adjusted EBITDA increased 20% and the corresponding margin was 26.4% versus 23.6% in the prior year. Excluding the reorganization charge, adjusted EBITDA increased 21% and the corresponding margin increased 320 basis points to 26.8%. Underlying operating profit increased 9% and the corresponding margin was 20.0% versus 19.5% in 2010. Excluding the reorganization charge, underlying operating profit increased 12% and the corresponding margin increased 90 basis points to 20.4%. Adjusted EBITDA growth and underlying operating profit growth across both divisions was due to flow-through from higher revenues, integration savings and the benefit of currency. Adjusted EBITDA also benefited from lower integration expenses. Excluding currency, adjusted EBITDA increased 17% and underlying operating profit increased 7%. Adjusted EPS was $1.98 compared to $1.56 in the prior year. The increase was largely attributable to higher underlying operating profit and lower integration expenses. 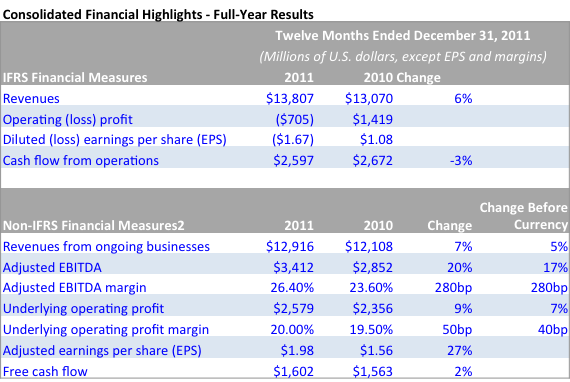 Adjusted EPS excluding the reorganization charge was $2.03. Currency had a $0.06 favorable impact on adjusted EPS. Free cash flow was $1.6 billion, up 2%. Corporate expenses were $273 million versus $249 million in the prior year. The company incurred a $3.0 billion goodwill impairment charge in the fourth quarter. This non-cash charge was the result of the company’s annual goodwill impairment testing required under IFRS and related to the company’s financial services business. On an IFRS basis, EPS including the goodwill impairment charge was a diluted loss per share of $1.67 for the full year. This non-cash charge will not impact the company’s normal business operations, nor will it affect liquidity, cash flow from operations or financial covenants under the company’s outstanding public debt securities or syndicated credit facility.